Morna Edmundson is one of Canada’s best-known choral conductors with a strong reputation for excellence. Passionate since childhood about choral singing, she obtained degrees and diplomas in vocal music in Vancouver, Bellingham, and Stockholm, Sweden where her teachers included Eric Ericson. In 1987, she co-founded Elektra Women’s Choir with Diane Loomer, a treasured partnership that lasted 22 years. In 2009, Morna became Elektra’s sole Artistic Director, continuing the choir’s strong leadership role in concert presentation, commissioning, recording, and mentorship. For 14 years Morna shared her love of quality repertoire with a new generation of singers in her role as Associate Artistic Director of Coastal Sound Music Academy, where she was Music Director of the mixed-voice Youth Chamber Choir. 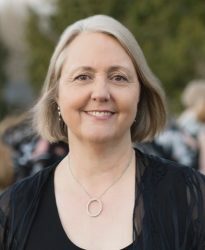 Morna has adjudicated in North America and Asia, conducted honour choirs in several states, co-directed the American Choral Directors Association National Women’s Honour Choir, and gives frequent workshops with choirs of all ages. In 2000 she was presented with the Healey Willan Award for outstanding service to the BC Choral Federation, an organization she serves as a member of the Willan Council. In February 2009 Morna was a recipient of the BC Community Achievement Award, which recognized her gifted organizational talent, leadership by example, and her encouragement of others to pursue their musical and choral goals. In June 2011 Morna received a Vancouver YWCA Woman of Distinction award in recognition of her work with Elektra. Since 2013, she has served as a Board member of Chorus America, the advocacy, research, and leadership development organization that gives voice to the choral field.